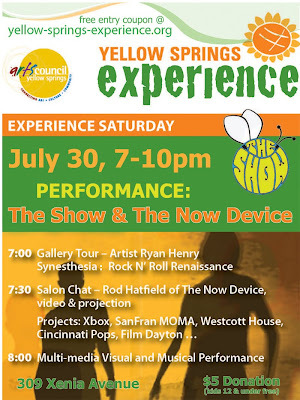 The Yellow Springs Arts Council presents Experience Saturday, July 30, 7-10pm. 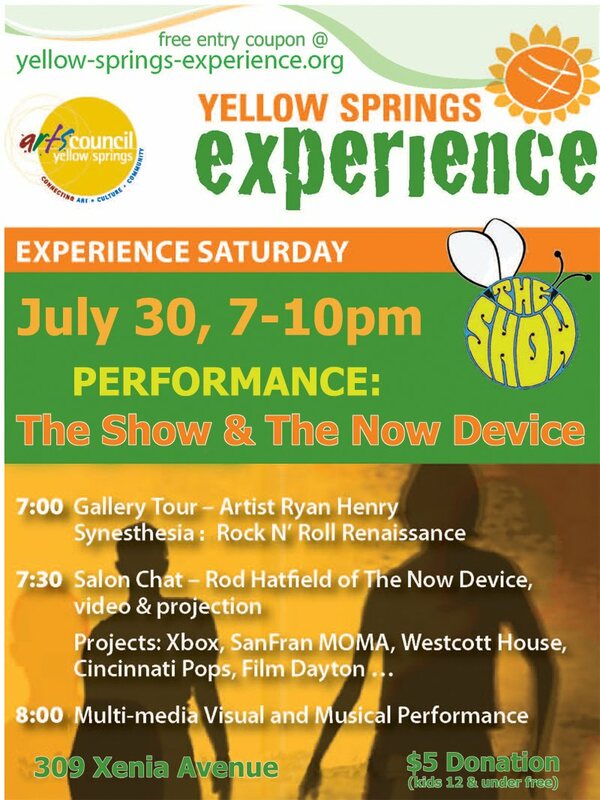 Don’t miss YSAC’s first event in our new Experience Saturday series—a special multi-art evening with local rock band The Show and visual media group The Now Device. Evening line-up: 7pm Gallery Tour of art exhibit Synesthesia: Rock N’ Roll Renaissance by Ryan Henry, 7:30pm Salon Chat with Rod Hatfield of The Now Device, 8:00pm Visual Media Projection with Musical Performance. The Now Device is a Seattle based visual media company, co-founded by multidisciplinary artist and entrepreneur Rod Hatfield, that showcases live video mixing and projection. Rod's past projects include work with The Experience Music Project, Xbox, VH-1, The United Nations, San Francisco Museum of Modern Art and collaborations with Cincinnati Pops, FilmDayton, Seattle Theatre Group and Frank Lloyd Wright’s Westcott House. For more information go to www.thenowdevice.com. The Show, a Springfield-Yellow Springs based trio features Jessica Kinzer on keyboards and lead vocals, Matt Housh on drums and vocals, and Ryan Henry on guitar. The Show performs original, high-energy music that spans genres from garage and surf, to punk and funk. The event doubles as a CD Release Party and The Show’s debut self-titled album will be available for purchase. For more information go to www.myspace.com/theshowwillgrow. This music and multimedia performance will transform the YSAC Gallery and Exhibition Space into a unique, multi-arts environment. The event is open to the public with a $5 suggested donation at the door (kids 12 and under free). But be on the look out for FREE invitations, which are circulating Yellow Springs and can be found at the YS Arts Council and YS Chamber of Commerce through 7/29. Proceeds benefit the Yellow Springs Arts Council. For more information about the YS Arts Council, visit www.ysartscouncil.org.